Chrome bumpers help complete the “look” of the Heinkel cars, so it was important to me that mine not only show well but were also mounted properly. Like many other parts of my restoration project, this was easier said than done. Recondition or purchase new bumpers? I had two cars and almost two complete sets of rusty bumpers. My options were to straighten and rechrome what I had, or purchase new ones. I decided to purchase replacement bumpers. 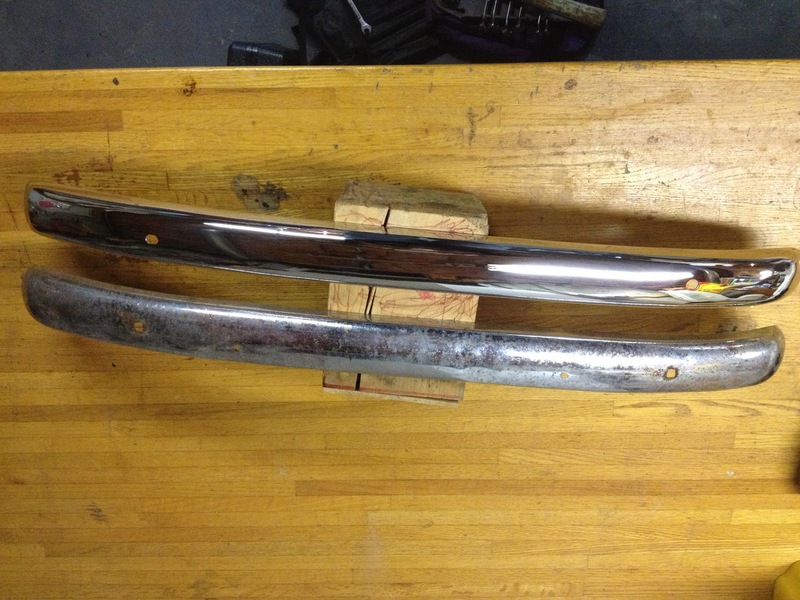 The new bumpers are made of stainless steel by the Harrington Group in Vietnam. They are available through special arrangement with the Heinkel Trojan Club at a preferential price. These bumpers are beautiful, they have a mirror like stainless steel finish (most people would think they were chrome). One concession I made was to mount a two piece (actually it's three pieces) rear bumper. My original bumper was a single bumper that wrapped all the way around the cowl. I’ll save that for my other car. I think the price for both options was about the same. Between the car body and the bumper is a hard rubber spacer. 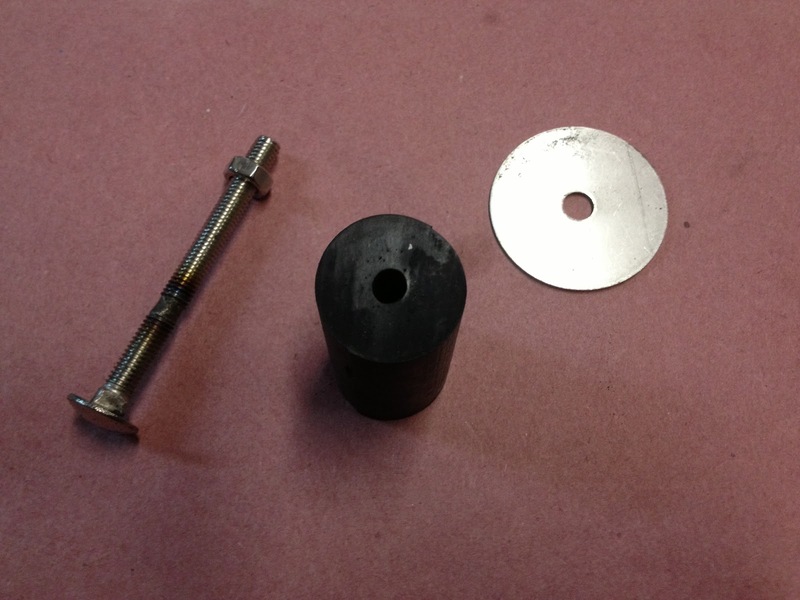 The spacers are round, about 1 ¼” (32mm) in diameter, and are cut at varying lengths and angles. Cutting these lengths and angles is a challenge. The challenge is that you need to cut them in such a way that they align horizontally as well as vertically. Since you can’t register a flat horizontal or vertical surface, you have to use your imagination on how to measure your angles and the length you need. The rubber spacers are not inexpensive. I think I paid 30 euros for two pieces, which is enough to do a car without much left over. So, I decided to practice using wood dowels. 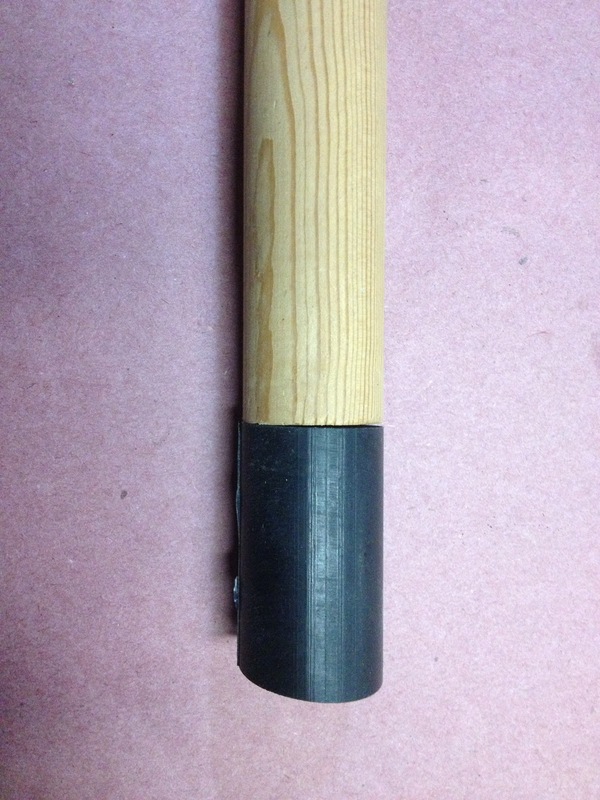 It turns out old fashioned wooden closet rods are exactly the same diameter as the rubber spacers. While the bumpers aren’t hard to mount, but it is very difficult to mount them so they line up properly. I remember looking at a lot of restoration pictures where the bumpers didn’t sit at the right angle. Most people wouldn’t notice, but it seemed obvious to me and I wanted mine to look perfect. The bumpers are attached to the car with a long 8mm bolt. The bumpers have a square cut hole to prevent the bolt from turning as the corresponding nut is tightened on the interior of the car. The rubber spacers go against the exterior of the body. As the bolt passes through the body sheet metal there’s a large fender washer, followed by another piece of spacer, a washer, and then the nut. Once you cut the rubbers you are ready to mount the bumpers. On the front wing bumper, don't forget to mount the horn. You may need to enlarge the holes in the rubber spacers to accept the bolt. Once you get the bolt through and have everything assembled loosely, it's time to start the fine tuning. I "fine tune" by twisting the rubber spacers to subtly change the angle of the bumpers. As long as you don't leave a big gap between the body and the spacer (which will be obvious) you should be able to get the bumpers aligned properly. It takes time, but in the end bumpers really help to make your car look great (and they may even provide a little protection too)!